and loved it so much that I just had to get it. It is a Lost Coast Design stamp. so I used this for the butterflies. Then it was obvious to me that I needed hot pink cs to bring out the colour of the butterflies. The small butterflies are stamped a second time, cut out and stuck on so that they lift up. I have added some glitter on their wings. I think the more I look at this the more I really like the hot pink. Hiya Dot, your card is really beautiful. The butterflies look stunning in those colours, and look lovely with the image. Hi Dot, I love the image you used and the colours are gorgeous. The butterflies are a perfect finishing touch. Thanks for joining us over at the Outlawz Twisted Thursday "Be an Angel" challenge. This is certainly a gorgeous image Dot and you have showcased it to perfection. The colours are stunning, so vibrant and eye catching and I just adore your butterflies. Have a great creative weekend. waa, what a beautifull card! !Great colours and what an nice accent at the butterflies, I really love all the details!!! Wow Dot! 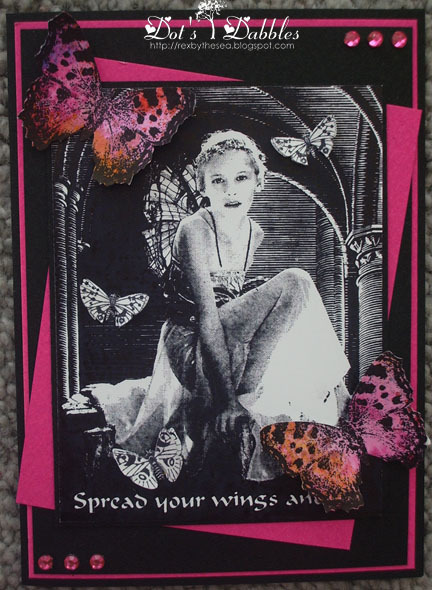 A totally stunning creation and the gorgeous image looks amazing with the bright pink. I have this stamp too and just love it. PS: I haven't forgotten about the mottle background and a how to will be winging your way very soon. Its a gorgeous stamp, your card and colours are fantastic. A very nice card, and the stamp is great indeed! Hi Dot, This is fabulous, love it with the hot pink! Enjoy the rest of the wekend. Lovely design and layout. I think your butterflies suit your image perfectly! Thank-you for sharing with us at The Poodles Parlour! The hot pink works beautifully. Thanks for showing your fantastic card for paperminutes. A wonderful card, great details. You are definitely a hot pink girl Dotty baby no doubt about it, this looks gorgeous and very very hot.